Repeated exposure to sunlight, especially ultraviolet light, can cause a variety of cosmetic and medical problems in our skin. These include telangiectasia (red or purple “spider veins”), uneven pigmentation, lines and wrinkles, thinning of the skin, loss of skin elasticity, and melanoma and other skin cancers. 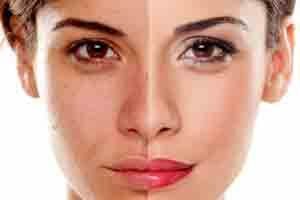 The damage our skin suffers from sunlight is cumulative and often gradual, so the effects appear as we age and worsen with time. Adequate protection from the sun and avoidance of other sources of ultraviolet light such as tanning salons are an important part of preventing this damage. However, there are ways to cosmetically improve damage that has already been suffered. Injectable fillers such as Restylane®, Juvederm XC, and Radiesse out lines and wrinkles to give the skin a fuller, smoother look and feel. Phototherapy can reduce the appearance of uneven pigmentation, spider veins, and other vascular lesions. Laser treatments may also be effective for these conditions. Chemical peels and microdermabrasion remove the surface layer of skin to expose a fresh, healthier, younger-looking layer beneath.